In Boise’s Historical District, Kevin Settles and Dave Krick have established America’s first distillery pub in December 1999. Bardenay Restaurant Distillery, confirmed by the BATF as the first in the country, opened its doors for the new millenium with the focus on high quality cocktails, and great food. Bardenay’s name comes from a term used by sailors for the ship captain’s cocktail hour, when the work stops and the fun begins. Cocktails and fun is what this pub is all about. They not only make their own spirits but also stock the back bar with top of the line products from around the world and employ a fun and knowledgeable staff. Attention to detail is their hallmark and it starts with the best of the world’s gins, vodkas and other spirits and continues down to the freshest quality garnishes. The building, a turn of the century brick edifice situated at 6th and Grove in the refurbished Basque block of Boise, offers an upscale décor rich in wood, brass and chrome that is nicely balanced by the old wood roof trusses and vintage brick. The centerpiece of the interior is the gleaming brass and chrome German pot still ensconced behind an octagonal glass partition at the back. The glass partition is not only eye-catching but also functions to separate the restaurant from the distillery which is a necessity to obtain a license from the BATF. The distillery is kept totally separate from the restaurant and bar by law. No spirits go into the distillery room and no products leave without the proper tax stamps. The still produces a trio of products for the bar; vodka, gin and rum. The rum is unremarkable. It is made for mixing in cocktails and does as good a job as most. The vodka is a work in progress although all of the components for good vodka are there; long legs, a robust burn in the nose and palate and a good long finish. However it suffers from an oily, sweet nose with a noticeable aroma of vanilla. Owner Kevin Settles says, “The vodka is still in the process of refinement; we are working on cleaning up the nose”. The latest test batch was noticeably cleaner and is very promising. Bardenay prides themselves in offering “drinks you can’t find anywhere”. The innovative bar staff is continually formulating new cocktail recipes. The very nice house martini, garnished with frozen, blue cheese stuffed Maytag olives, proves the house gin is as good as advertised. Drinks such as the Iguanabana, a concoction of Bardenay rum, fresh lime and guanabana juice proves the creativity of the bartenders. Beer drinkers fear not, Bardenay has two dozen taps with selections ranging from Guinness and hand pumped cask conditioned ales to domestic micros and major brands. The restaurant features a full menu that should please anyone from brunch to dinner. Prices are competitive with other restaurants in this trendy area which is just three blocks from the state capital. 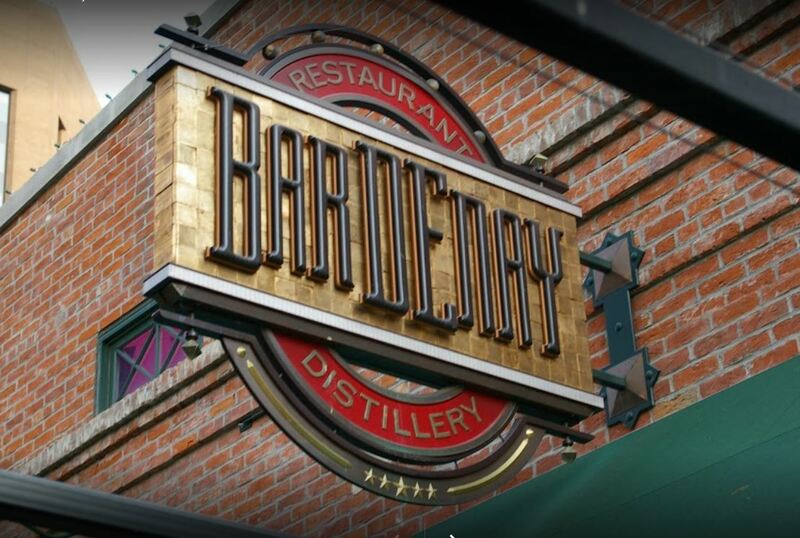 With a wide ranging selection of drinks, spirits produced on premise, pleasing décor and fine foods, Bardenay is a don’t miss stop in Boise.